I was thinking for the past few days and can’t help to write the things running in my mind. There are certain things in our life that cannot be erased though we did our very best to forget those things, but eventually the least you expected to happen will hang on your face and when you look at your back its shadow still remains. Life is indeed very ironic. 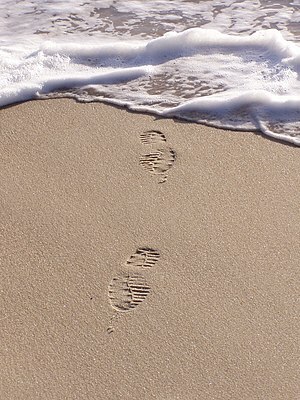 The sand is your life, the footprints you made were the past things you did and still remain. The air may erase the footprints… but sometimes, the deepest footprints you made in the sand cannot be erase by the air of time. The way you treated them, specially when you marked the footprints in a beautiful one, will always be in their hearts and will always be in their mind. Everytime i encountered someone or people…. I always give them the best treatment i could ever show them. Doing my best to be the best friend, the best person i can be is always in my principles and rules. I didn’t realized that what you have planted in their lives will always grow inside them, specially the beautiful seeds you have planted in their hearts. It may be an advantage,but now… it seems to be a disadvantage specially in love. The footprints you have in me was already erased by the air of time. and i can no longer recover. The memories you can’t forget will remain as memories and will always be.